In the blogger platform, the visitors from using mobile phones will be redirected to the URL with the suffix http://<yourdomain>/title.html?m=1, if we enable mobile blogger template. But if we turn off the mobile template blogger, the visitors from mobile devices will be redirected to the link with the suffix http://<yourdomian>/title.html?m=0. A link with the suffix ?m=1 or ?m=0 will cause duplicate content either Meta tag description or title tag. Since both of these links will lead to the same page. This can be seen on Google search console at HTML Improvements in Search Appearance section. 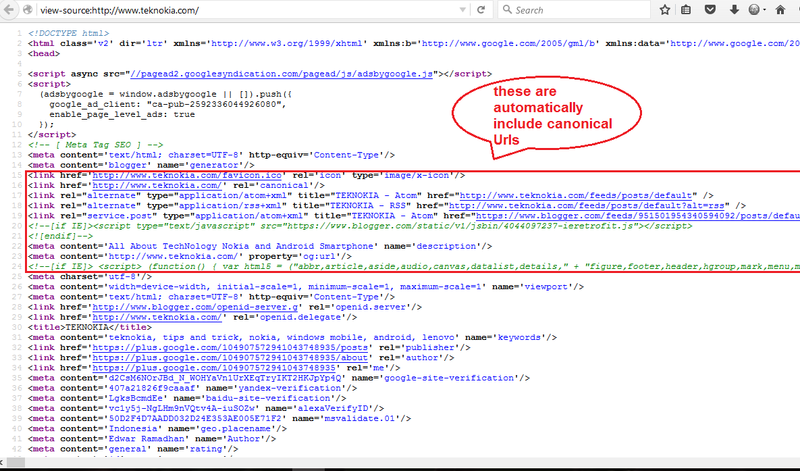 Google advises us to use canonical URL to tell the Google robots as the original link so that Google robots will ignore the multiple links in addition to canonical urls for index. Then how to install the tag canonical URL on the blogger platform? Many of the bloggers is wrong in putting up this canonical URL code just like (<link expr:href='data:blog.url' rel='canonical'/>) , on their template. They put up the tag manually. So when we access from a link with the suffix ? m=0 or ?m=1. then the canonical urls became ending ?m=0 or ?m=1 too. 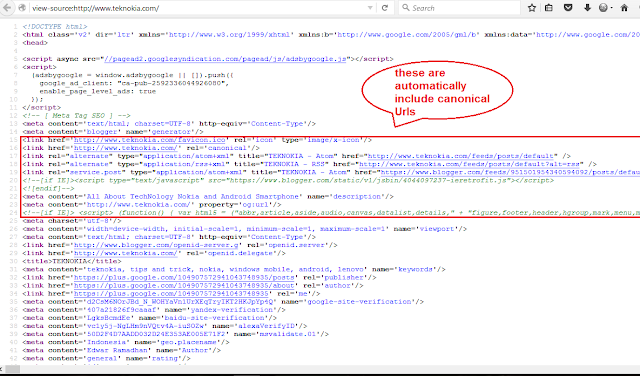 Actually on blogger, already provide the canonical URLs Meta tags automatically. So when we access from any device, the canonical urls is using the original links without the suffix ?m=0 or ?m=1. When we doing press CTRL+U on Browser, this code is automatically becomes many code that setting by blogger. such as canonical, favicon, etc. 2. Remove code <link expr:href='data:blog.url' rel='canonical'/> from your template. this code is caused duplicate contents.